Sometimes where I find a parking spot for sketching determines the composition of my sketch. I could have parked directly across from this yellow house but there was a tree blocking my view (and I didn’t want to include it). I moved a few spaces over in the parking lot and that gave me a bit of the facade and a bit of the side of the house and quite possibly a more interesting composition. Certainly a more dynamic sky shape, if nothing else. 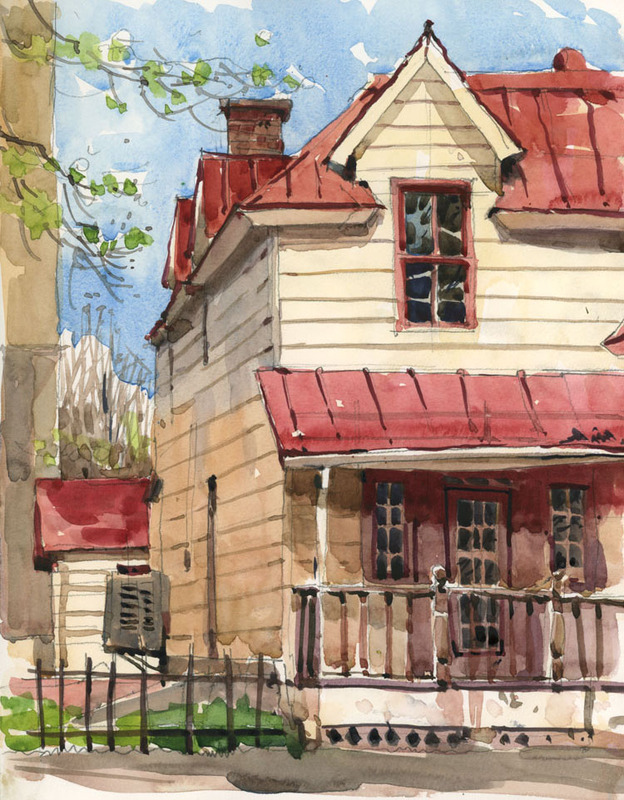 Sketched in a Handbook Watercolour Journal, 9″ x 12″. I have certainly used artistic license plenty of times, so perhaps I was just looking for a view with more depth. Thanks for writing! I paint and draw from my car very often and find the same thing happens. Love it.. Shari..Jacques cut himself ..and we enede up being 5 hrs at Emerg,I actually brought a mini travel kit and painted:) Thanks for the inspiration! Shari I find it amazing that you make even the dullest subject beautiful. Where can I find a a schedule of your workshops? I like reading how you came to terms with the view and composition, the result feels so good! Thanks Gil. It’s always nice to hear from you! Simply gorgeous! I love the composition and the little bit of blue sky so hopeful of Spring forthcoming. Sooo nice to look at. Thank you for sharing. Thank you Bernadette. Yes, a little bit of blue sky is good. We’ve had so much rain this week. Lovely!!! I am impressed with your varied colors on the shaded side of the house. Sometimes it is great if the universe aligns and we get lucky and can park in a space with a good composition. Yes Joan, good sketching is entirely dependent on good parking, at least for most of the year in Montreal. Love it … and that negative sky shape works so well against the rest of the sketch.